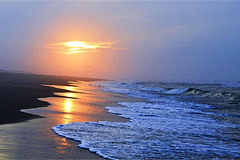 These days, it seems like everybody has a list of the world’s “most beautiful” beaches. The sheer quantity of sand and sea on this planet makes that an easy list to compile. But after a while, a lot of the world’s coastline starts to sound the same (sugary strands, azure water, the gentle sway of palm trees). In fact, it starts to sound — dare we say it — downright mundane. With that in mind, we set out to find destinations with legacies. To pass our test, a beach not only had to have the kind of story you would want to share with your friends, but it also had to be the kind of place where you would want to lay your towel. That’s why you’ll find places like Malmok Beach in Aruba (site of the largest deliberate shipwreck in the Caribbean) and not the D-day beaches of Normandy, which, while deserving of a visit for their historical value, don’t rank high on a sunbather’s list. Without further ado — 10 places where you can soak up a little culture with those rays. There’s evidence of a settlement here as far back as 3,000 years ago — and still plenty of fossils to be found along its marshes — but this village on England’s Yorkshire Coast is most famous for being a smuggler’s haven in the 1700s. Protected by marshy moorland on three sides, the bay served as an epicenter for the tax-free smuggling of contraband like tea, silk, gin, and tobacco traveling via ship from places like France and the Netherlands. So big was the operation that it’s said that fishermen, farmers, the gentry, and even the clergy were involved. During struggles between the smugglers and tax men, bay wives would pour boiling water out of the windows of the houses onto law enforcement. There were so many secret passages that a smuggled bale of silk could supposedly travel from the bottom to the top of the village without leaving the houses. Getting There: Regular train service runs from London to York; change there for a train to Scarborough, from where bus service is available to the bay. Ferries also run daily from Rotterdam to Hull, one hour away. In the early years of World War II, the German freighter Antilla — which carried supplies to the submarines patrolling the waters off the coast of Venezuela — was allowed to dock in Aruba. Though Aruba was initially a neutral zone, the island joined the Allies once Germany invaded Holland in 1940 (Aruba was a member of the Dutch Antilles at the time). The Antilla was ordered to surrender. The captain agreed to yield the next morning, but when the police arrived, there was no ship. Turns out the captain had sunk it himself, just off of Malmok Beach, so it wouldn’t fall into Allied hands. Today, the 400-foot Antilla is one of the largest wrecks in the Caribbean and is home to diverse marine life including giant ruby sponges, coral formations, lobsters, and a variety of tropical fish. Today: Thanks to the Antilla, Malmok Beach attracts both history buffs and snorkelers and divers, who love exploring the ship’s remains in the clear waters. Because the ship sits in only 60 feet of water, divers enjoy a lot of “tank time” at the wreck, though it’s so large that you’ll need several dives to explore it all. If you’re not into diving, take the steps down to Boca Catalina, a secluded bay that’s great for swimming. Discover the island where one of the world’s most famous pirates was captured. This island in the Outer Banks of North Carolina sits in middle of what was in the 1700s a busy thruway for large trade vessels carrying goods from all over the world. Naturally, with all this booty to be had, the place was swarming with pirates, too. Legendary pirate Edward Teach — a.k.a. Blackbeard — moored at Ocracoke before accepting a pardon and promising to quit the plundering life. But within weeks, he was back at it, so the Virginia governor gave the order for Blackbeard’s capture, which happened on Ocracoke in 1718. Getting There: Unlike other Outer Bank islands, which are connected by bridges, Ocracoke is only accessible by ferry, private plane, or boat. A free 40-minute ferry transfer is available year-round from Hatteras; the ferry that leaves from Swan Quarter requires reservations and takes a little over two and a half hours. Located in Tasmania, this beach often shows up on “world’s most beautiful” lists — but its past is not so picture-perfect. In the 1820s, whalers descended on the bay, sparking conflict with the native Pydairrerme aboriginal tribe. From their shore bases, the whalers would set off in small boats to chase and harpoon whales; once they caught one, they’d tow the carcass back to shore, where they’d butcher it and boil the blubber down for oil. (The oil was sent back to England to be used for lighting, and the whalebones for ladies’ corsets.) 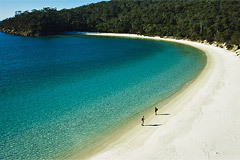 Whenever the whalers were working, all that whale blood would stain the bay dark red — earning it the name Wineglass Bay. Whaling only lasted about 20 years on the peninsula. Today: Wineglass Bay is part of Freycinet National Park, which takes up most of the Freycinet peninsula on Tasmania’s breathtaking east coast. The park is popular for sea kayaking, boating, rock climbing, and bush walking, while the beach attracts travelers from around the world. America’s first oceanfront national park. This beautiful part of the Massachusetts coast stretches 40 miles from Chatham to Provincetown. Back in the early 1900s, the area was mainly made up of private land and was a favorite with the Kennedy clan, who spent their summers on the cape. When John F. Kennedy landed in the Senate, he sponsored legislation to make the area a protected national park. In 1961, when he was president, he was able to officially establish the Cape Cod National Seashore, making it the country’s first-ever oceanfront national park. Today: More than 4 million visitors a year enjoy the Seashore’s pristine lighthouses, wild cranberry bogs, waterways, biking trails, and six swimming beaches; the latter include Coast Guard Beach in Eastham and quiet Marconi Beach in Wellfleet, which is framed by an 85-foot sand cliff. Getting There: The National Seashore is just under a two-hour drive from Boston. Most of the national park stops are found along Route 6 between Eastham and Provincetown. In England, the concept of the modern “seaside resort” really took off in the 1700s, as doctors began touting the health benefits of ocean water and the coastal climate. At the time, beach visitors would disrobe in “bathing machines” — a small changing room on wheels that would get pulled into the water by horses, making it easy for the ill or elderly to step directly into the sea. In Victorian times, women — including Queen Victoria herself — used bathing machines to help protect their modesty, but as the popularity of sunbathing grew in the 1900s, these movable shacks were ditched in favor of stationary huts or tents — typically rentable by the hour, day, or week — that served as a bather’s private beachside base. Bournemouth built the U.K.’s first municipal beach huts in 1909. Today: Nearly 2,000 beach huts of all shapes and sizes now line the five-and-a-half-mile promenade of popular Bournemouth Beach — about 70 percent are privately owned and the city council operates the rest. Huts typically come equipped with deck chairs, curtains, and a small gas stovetop. 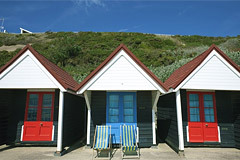 From $13.70 per day, bournemouthbeachhuts.co.uk. Getting There: Bournemouth is set on England’s picturesque south coast, a little over a 90-minute train ride from London’s Waterloo Station. Home to the world’s longest-running surfing competition. Tempted by its great breaks, local surfers were flocking to this sandy strip along Australia’s southern coast as early as 1949, even though access at that time was not so easy. About a decade later, an enterprising young man by the name of Joe took matters into his own hands. He paid 30 pounds ($60) to hire a bulldozer and clear a road from the cliff to the beach. He recouped the costs by charging fellow surfers a pound to use his road — and this famous surf spot was officially born. 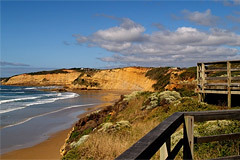 The first Bells Beach Surf Classic — now called the Rip Curl Pro Surf & Music Festival — took place here in 1961. When the ancient Romans went on vacation, they went all out, embarking on grand tours of important sites — including Greece and Egypt — that could last up to five years. The journeys would often start closer to home, though, with a first stop at the seaside resorts along the Bay of Naples. For several hundred years, Rome’s super rich would vacation in Baiae, a fashionable town with medicinal hot springs, beautiful villas (including those of Julius Caesar and Nero), and hedonistic parties. Today: Though Baiae was deserted by 1500 (its ruins now lie under the Bay of Naples), a modern-day equivalent would be Capri, the see-and-be-seen island in the bay. 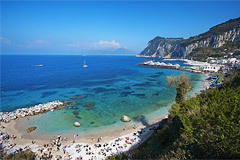 Still a playground for the jet set, Capri’s beaches are mainly rocky, but popular nonetheless. The lovely beach at Bagni di Tiberio, near the island’s fishing district, was once the site of Emperor Tiberius’s seaside palace. Getting There: There is regular ferry and hydrofoil service between Naples and Capri; the ride is between 40 to 80 minutes. Though ocean liners were transporting travelers and cargo across the Atlantic from the mid-1800s, it wasn’t until 1900 that a ship was specifically built for leisure cruises as we know them now. Dubbed the Prinzessin Victoria Luise, the luxury ship was constructed for the Hamburg America Line and included 120 first-class staterooms, a gym, and even a darkroom for amateur photographers. The ship departed New York on January 26, 1901, for its first official cruise, which included a stop on the island of St. Thomas. The vessel continued to sail though the Caribbean and Mediterranean for nearly five years, until it accidentally ran ashore in Jamaica in 1906. Today: St. Thomas is one of the busiest cruise-ship ports in the world; in high season, up to 10 ships a day might dock at its various terminals. 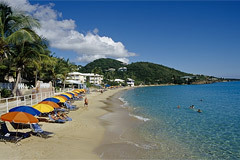 Aside from duty-free shopping, visiting the beaches is one of the top activities for cruisers, and popular choices include Magens Bay on the north side and Lindbergh Bay’s Emerald Beach on the south. To experience a bit of what those original cruise passengers did, though, head to the pristine beach on car-less Water Island. Getting There: Water Island is about half a mile from St. Thomas and linked by regular ferry service from Crown Bay Marina, a short walk from the Crown Bay cruise-ship dock. Canada’s first legal clothing-optional beach. Though Vancouver’s Pacific Spirit Regional Park features several sandy spots, including Acadia Beach and Tower Beach, the most legendary is four-mile-long Wreck Beach, Canada’s first legal clothing-optional beach and one of the biggest of its kind in the world. Set 542 steps below the park’s Trail 6, the secluded area became popular with naturists in the 1960s and ’70s. In 1977, the Wreck Beach Preservation Society was formed to help protect this unique haven; over the years, they’ve successfully rallied against encroaching construction, environmental threats, and privacy and “morality” issues to keep the place fun and — true to their mission — family-friendly. 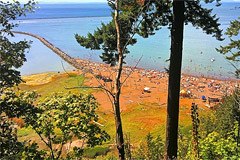 Getting There: Wreck Beach is on the western-most point of Vancouver, near the University of British Columbia campus. The C20 TransLink bus will take you to the Trail 6 sign at the intersection of Northwest Marine Drive and University Boulevard. From there, it’s 542 wooden steps down to the beach. Imagine buying your SIM-free mobile phone from a local electronics store and logging into your Google or Apple account as soon as you turn the phone on for the first time. Then imagine having the phone ready to use for voice calls with a phone number provided to you by Google Talk or Skype, and ready to access email, YouTube or Facebook. It only takes one carrier to crack and start selling bandwidth to Google, Microsoft or Apple; all other carriers will simply have no choice but to follow. It’s like the prisoners’ dilemma from economic textbooks: If both prisoners don’t talk, both win. But if separated and one is promised a way out (or an easier sentence) and he talks first, then game theory suggests the winning strategy for each prisoner is to talk. In other words, one of them will crack. They are nowhere close to being united enough to stand together, even in the short to mid-term. Look how effortlessly Apple, then everyone else, took over their app distribution businesses — something that only five years ago would have been totally unthinkable. We were taught that work is worship. If you do your work and duties promptly and in the right manner, it is equivalent to prayer. But my perception (rather most of those living in the Arab World) of Ramadan is that this is a time when people (since they are fasting) take it as an excuse to shy away from work and show anger to those who make them work. Why? Mohammad Faris, CEO and founder of Productive Muslims, said that history teaches us Ramadan was a time of great achievement and industry. “If we look into history, we learn that Ramadan was a productive time for the Ummah. It is in this noble month that many great events occurred in the history of Islam like the victory of faith over disbelief in the Battle of Badr, the conquest of Makkah, Battle of ‘Ayn Jaaloot and other decisive battles,” Faris told Gulf News from his Jeddah offices in Saudi Arabia. “Unfortunately, Ramadan today is being accused of being an ‘unproductive’ month by many Muslim — and non-Muslim — employers working in the Muslim world. “This misrepresentation of Ramadan is highlighted by the actions of some Muslims who unfortunately use Ramadan as an excuse to be lazy, not get work done, and follow unproductive habits such as staying up all night at cafes and restaurants, thus feeling sleepy during working hours. “This is very important, as there are many sincere employees who want to work hard and be productive during Ramadan, but do not have the techniques or skills to do so consistently,” Faris said. “Second, businesses need to encourage a resilient mindset among their fasting employees, for example, a mindset that whether it’s Ramadan or not Ramadan, work has to get done and employees need to find a way to keep up with the work pace,” he said. 1. Have sincere intentions and work hard for an ultimate productive Ramadan. 2. Plan each day of Ramadan the night before. Choose three important tasks you want to achieve the next day and record them in your diary. 3. Never EVER miss Suhour, wake up at least an hour before Fajr and have a filling, balanced meal. 4. Start working on your most important tasks right after Fajr and get at least one or two done. 5. Try to take an afternoon nap, not more than 20 minutes, either just before or after Dhuhur. 6. Plan your Ramadan days (and life) around Salah times, not the other way round. 7. Block at least one hour for reciting the Quran each day. 8. End your fast with dates and milk or water, go to Maghreb prayers, then come back for a light meal. 9. Give lots of ‘physical sadaqah’; get involved in organising community iftars, charity drives, helping orphans etc. Earn rewards working for others. 10. Don’t miss an opportunity for Dawah. When someone asks you why you’re not eating, give them a beautiful explanation of Ramadan and Islam. 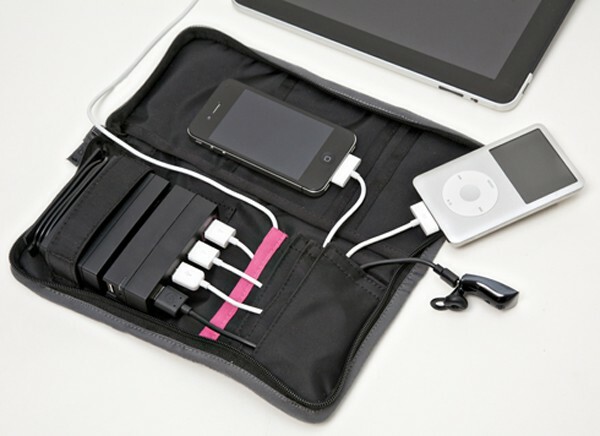 Neat little portable pack for charging all Apple products while on the move. Aviiq’s new Portable Charging Station -acts as a sort of USB hub in a bag, this little black travel sleeve lets you pack and power three USB devices — even an iPad — with one outlet. What’s more, the station allows for easy syncing by way of a retractable USB port.